A hot and humid July Afternoon had my partner David and I headed out to a small parcel of land in Southeastern Kentucky. We had scouted this property back in the winter and had a great idea of where we wanted a cell cam placed for inventory gathering. This particular property consists of about a 20-acre alfalfa field surrounded by heavy cover and some good hill country. On the eastern side of the property, we had identified a small watering hole with promising sign. The water was only a hundred yards or so away from the field edge and we determined this would be a good staging area for camera placement. Little did we know, the text messages sent from this camera would be the start of one hell of a journey these next few months. On the morning of August 17th, I was at work when I received a text message from my Bushnell wireless camera. It was a buck that immediately caught my attention. Not the largest antlered animal, but his body told me he was mature and in the 5+ year old age range. The picture was taken at 10AM that morning. Because of this, I had to make the assumption this buck was bedding close. This was the first promising sign of a target animal living near the small SE Kentucky parcel of land. Over the course of the next week, “The Heavy 10” buck continued making multiple early morning appearances. He was definitely a target animal and we were now taking all notes we could to put the puzzle together on him. The first picture text to me via wireless camera of my 2018 KY target animal. Taken over the Real World Maximizer Mineral provided by Genesis Outdoor Management with my Bushnell Wireless Trophy Cam. This was the start of our early season journey in KY for 2018. We named this buck “The Heavy 10” due to his very heavy antler mass. We knew this animal was in the 6+ age range due to his body structure and size. On the morning of August 24th, I woke up to one of the greatest text messages any serious whitetail hunter could receive. 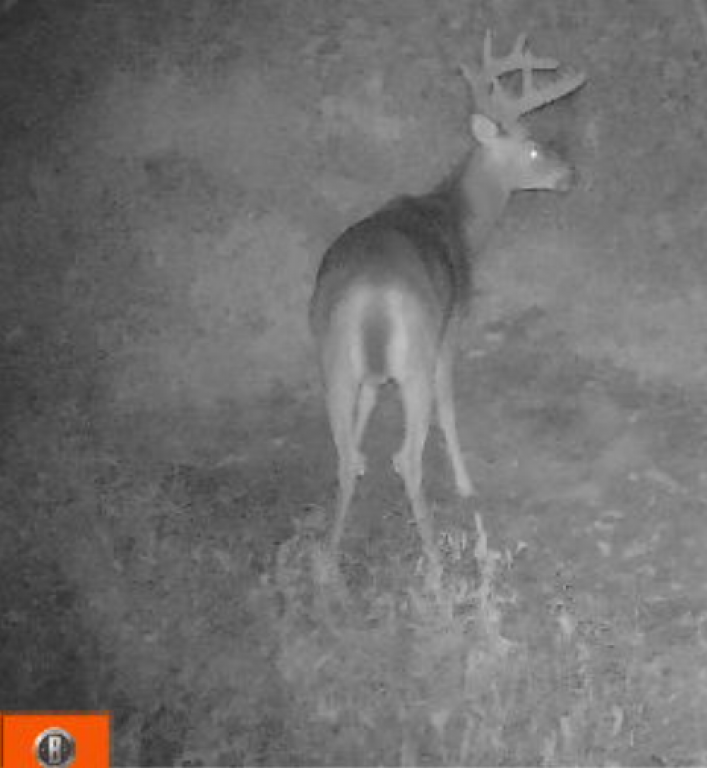 A mega buck had showed up on the Bushnell Wireless Camera between the hours of 3:00-4:00 AM. Although he most likely still had an hour or 2 left of travel before bedding, it was great to know that we had such a magnificent animal living within the vicinity of the property. We now had 2 confirmed target animals and one week left before the opening day of Kentucky Archery season. August 24th at 3:58 AM. The giant animal made his first appearance on camera. Friday, August 31st was the day before Kentucky’s opening day of archery season. The camera had not sent any recent pictures of either target animal. David and I had been pretty patient up to this point. We were sitting back and waiting on pictures to provide data and missing puzzle pieces. We had analyzed the map and topographically studied the property marking potential bedding locations these bucks could be located. At this point though, we had no answers or information telling us to make any moves. With that being said, I decided that I would pack my lone wolf stand and sticks in for an observation sit on the evening prior to opening day. David and I had talked about this move; the field was not loaded with alfalfa but it did have a large number of young alfalfa sprouts coming up in the pasture that appeared to be promising food source. The weather forecast was calling for storms, but I went ahead and loaded the truck up, then left for the farm. By the time I arrived, it was raining, thundering, and lightning all around. I had already made the hour long drive though and I was determined to get in a tree and glass the field for the evening. I got the Lone Wolf stand and sticks in place around 5PM and I was settled to watch the field until dark. By 7PM, the field was full of deer and it was evident the young alfalfa sprouts were an extremely attractive food source for the deer. However, neither target animals had appeared in the field yet. Around 7:30 the rain and lightning was strong enough that I felt I needed to get down from the tree. I quickly packed up my stand and sticks and threw them on my back. I had my binoculars strapped to my chest and the rain and storms had now passed over. With about 30 minutes left of light, I eased down the east side of the field tree line. As I approached the crest of the field, I stopped and looked to the west across the field. There he was, the giant buck we had on camera had just entered the field and was feeding on the alfalfa with a few other bucks around him. 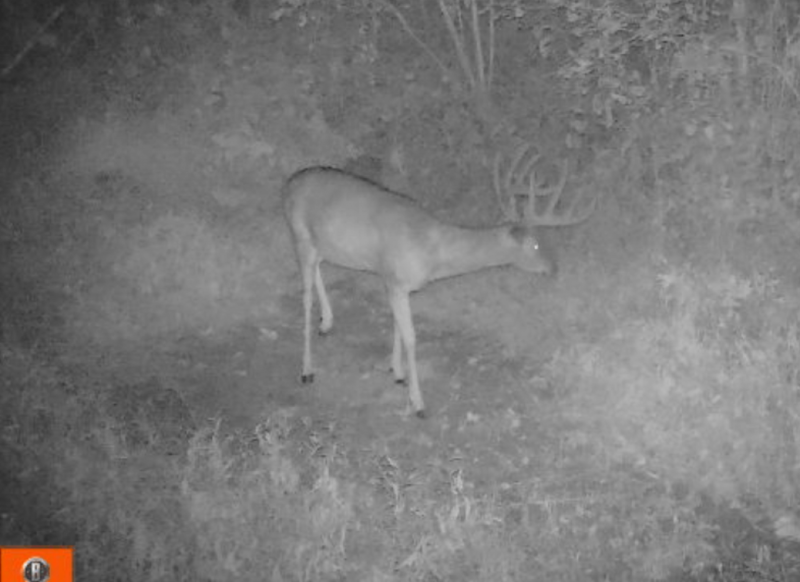 It was 100% the mega buck we had been texted via wireless cam on August 24th. I quickly took a knee up against a tree on the field edge and positioned myself where I could observe the buck. 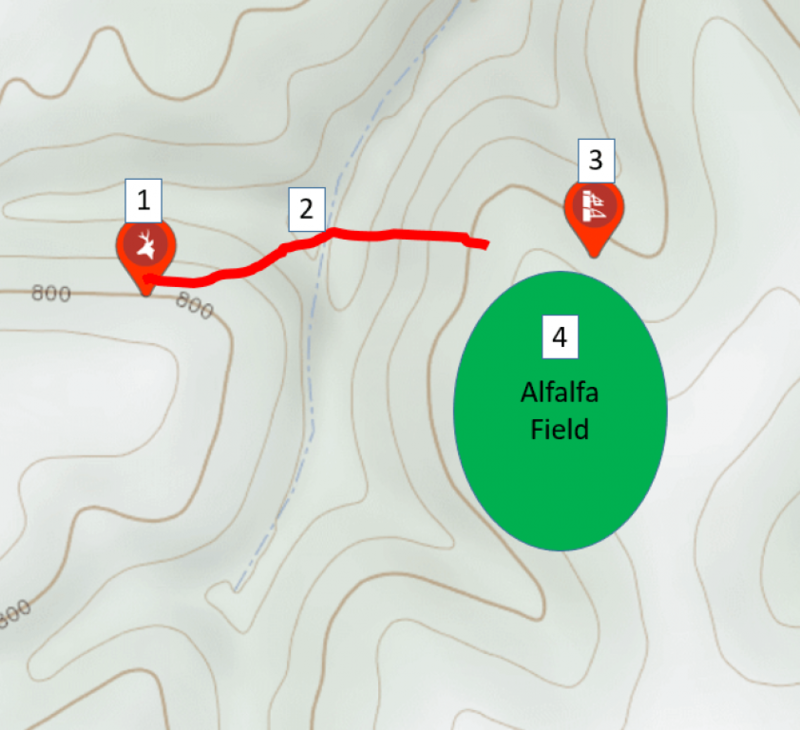 The trail he had entered into the field was very evident. I couldn’t wait to call David and tell him the news. As soon as I received phone service, I gave him a shout! I told him where the buck had accessed the field and that I had a tree picked out we could do a double set hang and hunt with our Lone Wolf stands. With that being said, I knew we would have our work cut out for us with getting in there early, trimming, and getting in the tree as quiet as possible. We both looked at the map and knew a South wind would be ideal for this setup. Based off topography, and where he entered the field, we pinpointed the bucks bed to be within 200 yards of the tree we were targeting. As fate would have it, the weatherman was calling for a warm and light wind out of the South. We felt that we had a solid plot in place for the Kentucky opener and the game plan was confirmed. I got over to David’s around 11AM on Saturday, the opening day of Kentucky’s 2018 archery season. I don’t think either one of us had slept much the previous night. We were filled with confidence, excitement, and chomping at the bit to head out and put action towards our plan. We got out to the property a little after noon. Upon arrival, we dropped milkweed and confirmed the hot and humid wind was still coming out of the South. We reviewed the map, and confirmed our plan was set for execution. Thanks to the Hooyman saw system and mobility of the Lone Wolf Stands, we were finally able to get setup in the stand and ready around 3PM. By 6PM the alfalfa field was filling up with deer. 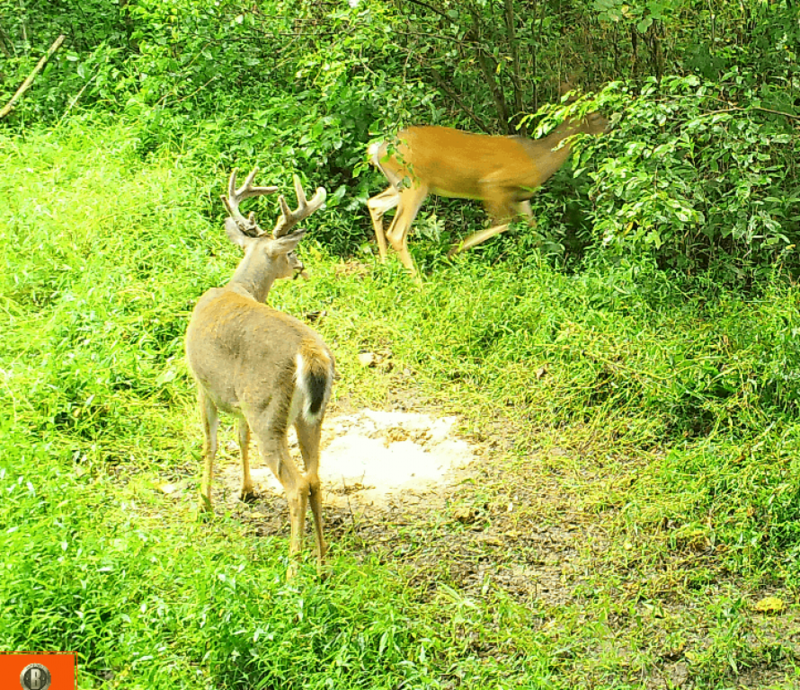 Many small bucks that we had wireless cam inventory on were beginning to enter the field. One particular buck was a half racked 10 pointer and a more mature animal. He read the script, as he entered the field right from where we anticipated the target buck to. This was a major confidence booster, as we waited for the action to continue. Around 7PM, there was a buck traveling to the field from behind us. There were some mature cedars behind us and he was slowly working his way through them. As he got closer, I realized it was a target buck, “The Heavy 10”. I told David to turn to his left and get ready, “The Heavy 10” was about to step out. Just before the old buck made it out of the woods and into the field, some nearby dove hunters began shooting rounds of shotgun rounds. This caused the buck to stop his motion towards the field opening, and return on the same path he came in on. The buck slowly disappeared back into the timber, not spooked entirely, but extremely cautious of his surroundings. David and I were both a little flustered at this point, all we could do is let the commotion settle down and hope the #1 target animal was still on track to repeat the previous evenings pattern. 30 minutes later the big 3-year-old, 140” buck we had inventory on, made his appearance into the field. It was on the exact same path I had watched the #1 target animal enter the field the previous evening. At this point, we were totally zoned in on the trail. Moments later, there he was, the giant target buck we had called “The big one”. He got his name because we really didn’t know what else to say. Between the cell cam pictures and the one observation I had of him the previous evening, all we really knew, is that he was a big deer. Like a textbook script though, here he was, walking the path out to the field like we had dreamed of. It was happening fast, and the bucks path had him out a little further than we anticipated. Nonetheless, he was broadside and I ranged him to be at 48 yards. David was drawn back and I had the camera running, it was go time. The buck stopped and observed the field and all surrounding areas for danger. He was ensuring safety before he stepped foot any further. “The Big One” where we recovered him in the creek bottom. 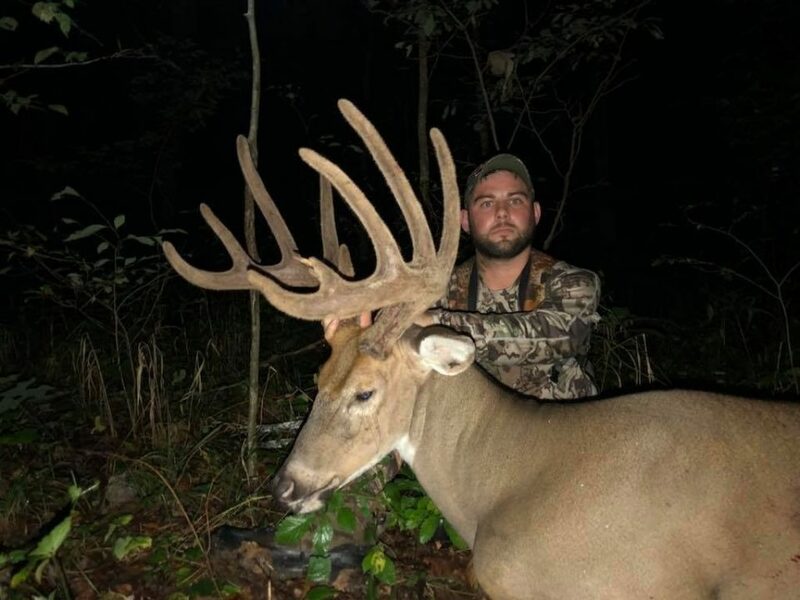 167 4/8” Opening Day of Kentucky 2018 Archery Season. We were speechless at this point and we both had turned into an emotional mess. The largest animal we ever had history with just plowed out of the field with 2 perfect shots placed on him. Eight days ago we did not even know this buck existed. Between 7 sleepless nights, constant gears turning, one evening of glassing, and a perfect kill strike; the target animal had been assassinated. Because we were not able to see the buck go down within sight, we decided to wait until dark to recover the animal. We slipped out to the truck and grabbed flashlights before heading back to where the buck stood during the second shot. We immediately found solid blood and began following the trail. The buck made his way to the NE end of the field and entered the woods. We had been on his blood trail for a couple hundred yards by now. The blood was not heavy, but looked good. We knew from the video footage; the shot was indeed fatal. Because of this, we continued following blood. We finally reached an opening above the creek bottom where we could see the creek ditch fairly well. We paused where we were at and scanned the ditch with our flashlights. There he was! “The Big One” had been successfully recovered. It was a surreal moment filled with adrenaline, emotions, and thankfulness for the opportunity to finally put our hands on the buck of a lifetime. Our target animal #2 was “The Heavy 10” and he had now earned a spot as the #1 victim to pursue. The weather the following two days was calling for similar conditions and the South wind was expected to hold true. Because of this, we made the decision to let the area settle on Sunday, and make the kill strike on Monday evening. 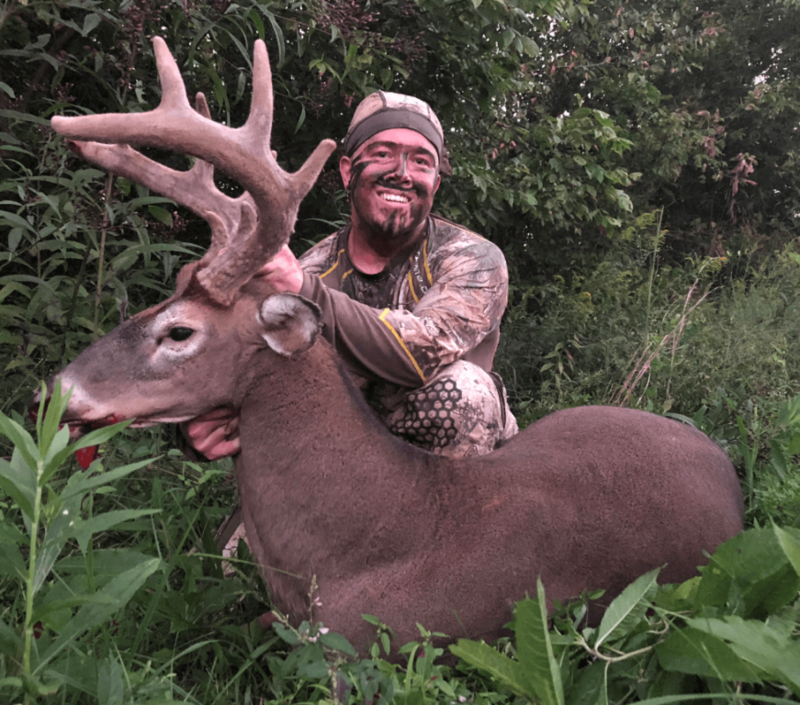 Although the buck had been “spooked” from entering the field on opening evening, we felt very confident that he was not too disturbed and we had a great chance of the pattern repeating itself. The schematic below represents bedding options we had nailed down for the target animal. 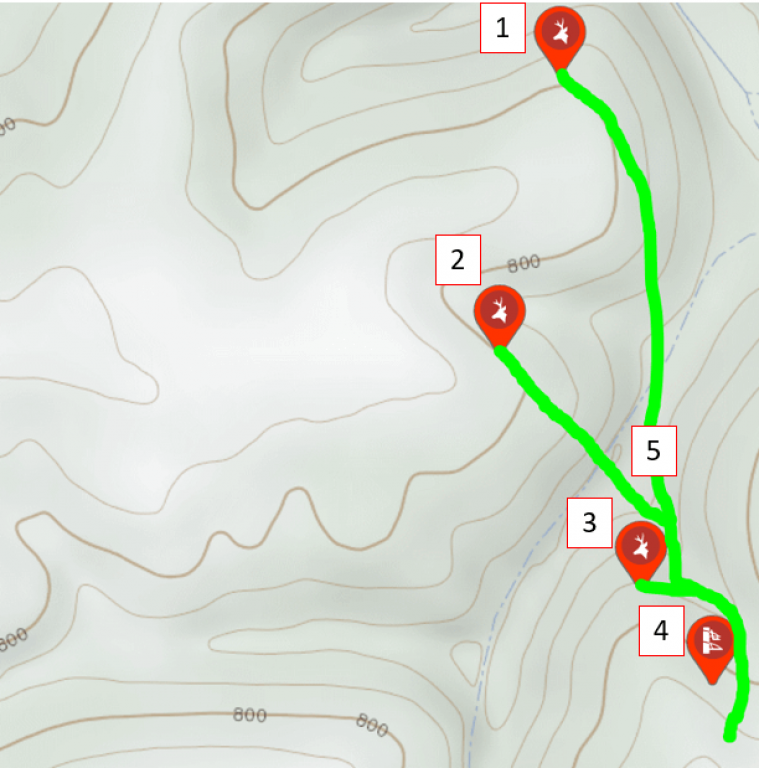 These locations were based off topography, a prevailing wind out of the south, and observing his travel path opening evening. I will say though, after reviewing this with David, we are nearly 100% certain the target animal was bedded on location 3. Both evenings we observed “The Heavy 10” he traveled the upper 1/3 of the ridge as he entered the food source. It made perfect sense he had come off the North facing point and stayed on the upper 1/3 of the ridge north of our location as he entered the field. 1.Potential buck bedding with South wind. 2. Potential buck bedding with South wind. 3. Potential buck bedding with South wind. 4. Stand location on field edge 5. Green line – bucks travel path depending on bed. It was Monday, September 3rd and the day had come to put our kill plot into action for “The Heavy 10”. We arrived at the property around noon and the weather conditions could not have been better. Upon arrival, we dropped milkweed and confirmed the warm south wind was still holding true. We already had our Lone Wolf Tree stand setup from the previous hunt so it was just our gear and the camera as we packed in for the evening hunt. Milkweed dropped again from the stand confirmed the warm wind was still out of the south. It was a hot one, with midday temps topping out at 94 degrees. The heat did not keep the deer laid down though and by 6PM there was already a field full of doe and smaller bucks. At 6:30 PM I heard what sounded to be a large animal walking through the cedar thicket behind us. I immediately noticed it was a buck, but could not tell exactly what deer it was. David was above me filming and could see the buck much better than me. “It’s the heavy 10” David said, and at this point the buck was damn near right under the tree behind us. I still could not see him at this point, I could just hear him intensely sniffing and browsing around the base of our tree. At this point, all I could think of was one word, OZONICS. The HR200 was on 100 power “boost mode” in the tree with us. This buck was under our stand at 10 yards down wind of us and never had a clue we were there. We literally listened to him sniff and smell for a solid 5 minutes and he could not peg down any danger. 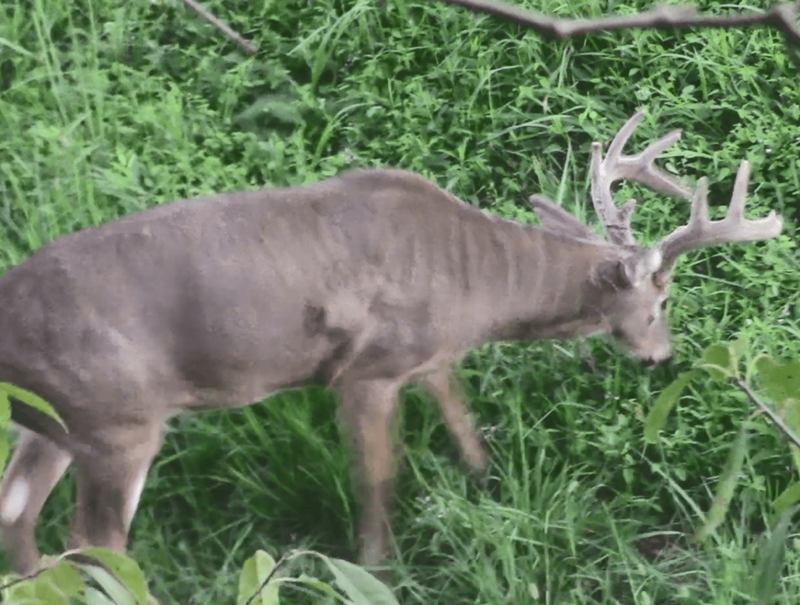 After what seemed like forever, the buck finally continued on his path entering the field. When he finally entered the clearing at 7 yards, there was no questions asked, it was certainly “The Heavy 10”. I settled the crosshairs of my crossbow right behind his shoulder and sent the bolt right through his chest. The buck plowed across the field and we watched him crash hard just as he entered the wood line. The chapter had been closed on target animal #2, hunt #2. “The Heavy 10” was dead! “The Heavy 10” receiving the death dart at 7 yards. “The Heavy 10” right outside the wood line where he died. We are estimating this buck to be 7+ years old based off body size, structure, and behavior. We are very fortunate that Kentucky opens archery season on Labor Day weekend every year. 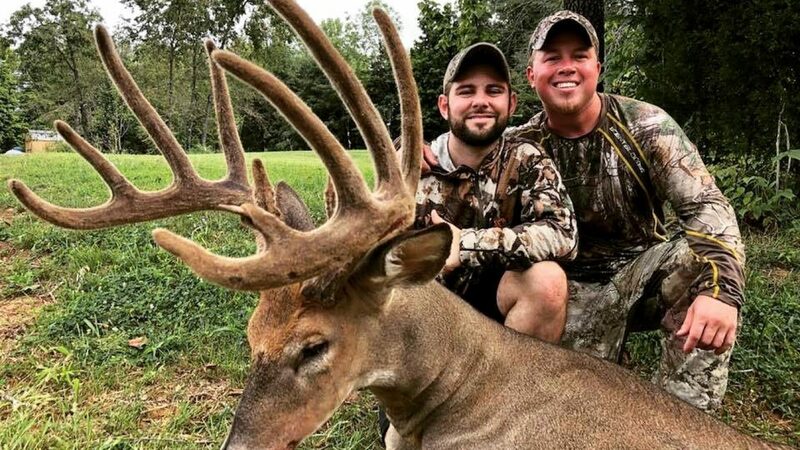 If the correct moves are made, early September can flat-out be the best time period to locate, target, and kill a mature buck. The bucks are still in their summer feeding patterns for the first couple weeks of September. This means they are conserving calories by bedding closer to food and gorging themselves with calories to put on weight and strength for the upcoming rut and winter. With that being said, locating solid food sources is critical for early season success. Once you have a general area you know is holding potential target animals, finding the food is next. The secret to success is observing as much as possible of the target animal without him knowing you are there. Taking as many notes on observation is critical for early season success. Although the bucks are bedding close to food, I still see them practice similar bedding habits as when they are in their core area. Typically, on a high spot just off the field, they will bed with the wind at their back, smelling any danger behind them and visually observing the food source in front of them. With that being said, mature bucks can be like humans and can vary in behavior. This is why making as many observations and gathering as much data as possible is critical. I have observed some mature bucks that like placing themselves in a position where they have the wind at their face, I have seen them bed in areas I still am uncertain why they were there, and I have seen behavior that I never would’ve guessed without making specific observations. There is nothing more valuable than observational evidence and hard data. In this case, we utilized a wireless cell camera to obtain pictures and information on the bucks. This allowed us to confirm 2 target animals were living in the area. The next critical piece of information came from the scouting observation sit on the evening prior to opening day. I hung my lone wolf stand on the adjacent field edge where I knew I was at least 300 yards away from the area needing to be observed. I was able to observe the target buck that night without him ever knowing I was there. Ultimately, this was the final puzzle piece that resulted in his death the following evening.